Are You Healthy Enough for Dental Implants in Temple? If you’ve lost teeth, you know that many aspects of your life are affected. Despite how a patient may have lost their teeth, dental implants are a way to give our patients in need their life back—both functionally and aesthetically. It’s time to restore your teeth and start a new chapter in your life. Dental implants in Temple can work wonders for regaining your confidence. Pazmino Dentistry can help re-stabilize your smile and improve your quality of life again. The dental process takes commitment to great oral health and improvements in your lifestyle. Let’s look at the process and what kind of patients are suitable candidates. When you think of a dental implant, think of an anchor. They’re created to hold something in place. 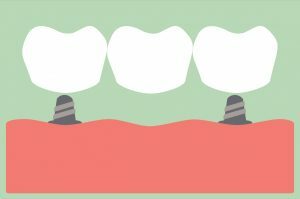 In dentistry, a dental implant is a surgically implanted anchor into your jaw. That doesn’t sound too inviting to most patients, but when you’re missing a tooth, it’s the best option to permanently restore your smile. A period will pass where your body is adjusting to the implant post and fusing it with your jawbone. After that phase, your dentist in Temple will place your abutment and attach the best dental prosthetic that’s best for you. Are you a viable candidate for dental implants? Enough bone density to anchor the implants in the jaw (if you don’t, there are bone-grafting procedures that may be completed to help you hit this requirement). Dedication to good oral health and hygiene both at home and by keeping regular dental appointments with your dentist in Temple. Who isn’t a viable candidate for dental implants? Young because their mouths haven’t stopped growing, shifting, and developing. Tobacco users (quitting is the best way to prepare you for dental implants and improve your health). People who have received high-dose radiation treatment of the head or neck. In the instance that your oral health isn’t up to a general standard to receive dental implants, we can do our best to help bring you to that level. A major determining factor is the density of your jawbone. Sometimes, because of deteriorating oral health, your jawbone cannot successfully hold these “anchors” in place. We’ll even work with you to plan a bone grafting procedure to restore the health of your jawbone. Are you ready for dental implants? Contact our office today to schedule an implant consultation! Comments Off on Are You Healthy Enough for Dental Implants in Temple?